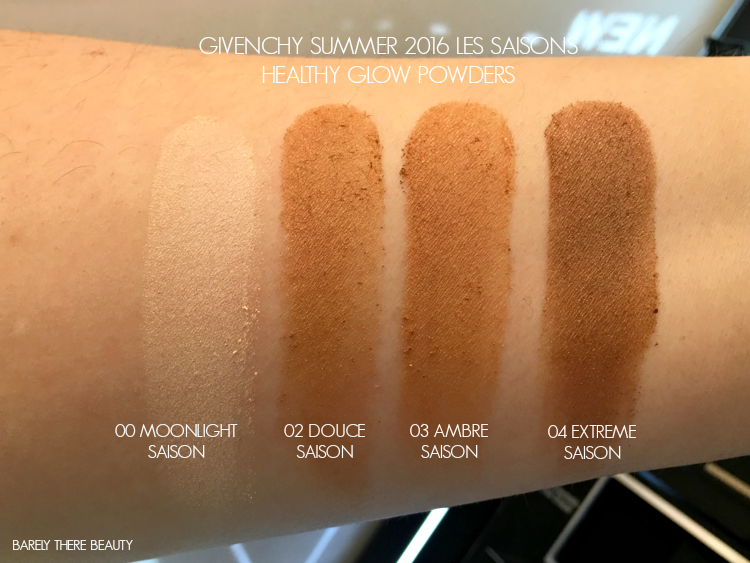 GIVENCHY SUMMER 2016 LES SAISONS COLLECTION | SWATCHES + FIRST IMPRESSIONS. Bonjour bonjour lovely readers, I know it's Monday Blues o'Clock, but I've got something for you today that might lift your mood! I was going to post something else today, as my last two posts were both 'looks at new 2016 collections' and I don't want that to take over things here on BTB! (although do go check out all the swatches of the Lancome Juicy Shakers, I'm in love!) 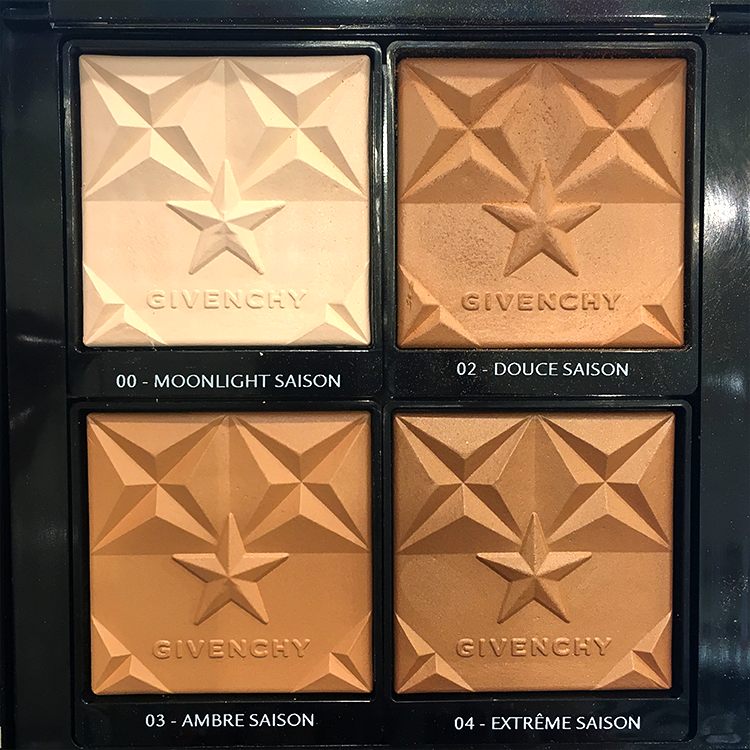 but whilst I was running some errands over the weekend I came across the Givenchy Summer 2016 'Les Saisons' collection and could not help myself. Read on for swatches, try ons, what I love and what's a bit bleurgh. 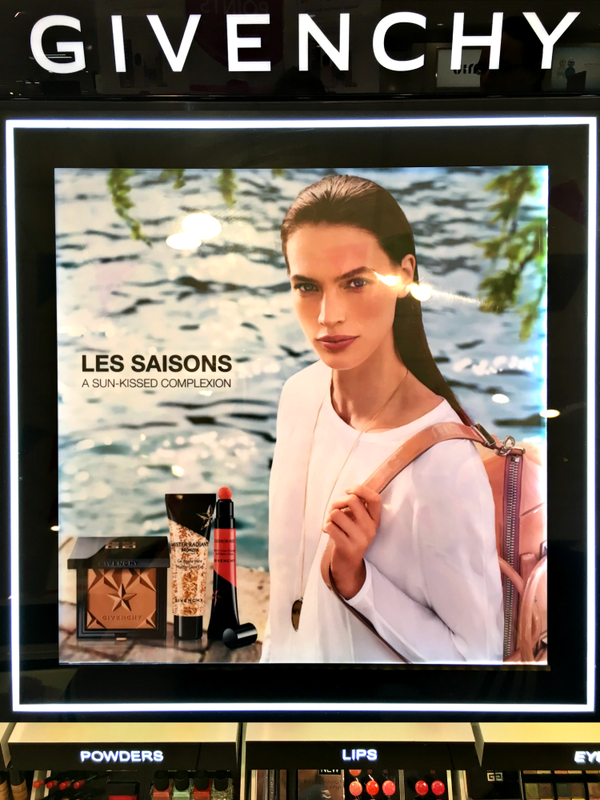 Les Saisons is all about natural beauty, flawless skin and dewy textures, which is everything I could ask for. There are 4 new face powders, 3 bronzey shades and 1 highlight, a gel bronzer, primer, blush and two new lip balm/glosses. You can pick up the range here at Feel Unique or the usual House of Fraser/Debenhams etc. 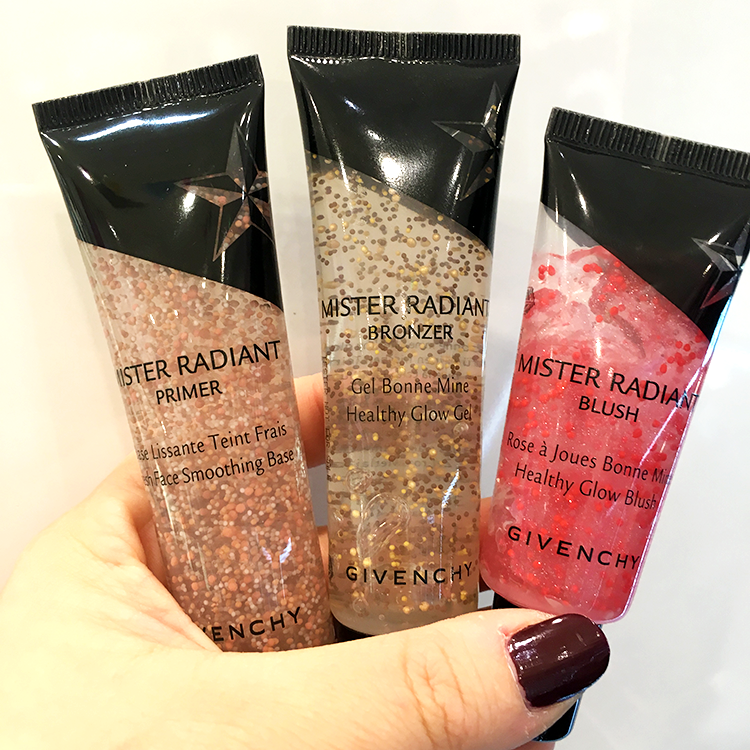 Mister Radiance Primer (£29) A similar concept to the blush, the watery gel this time contains peachy-pink and beige pigments that blur your complexion, even out complexion and add some brightness and luminosity, whilst looking completely natural. On first impressions, I really like this, we tried it on half my face first and you could see a difference! Mister Radiance Bronzer (£29) Gel products are my favourite kind of formula so to have a bronzer within the range makes me so happy! I really like the Stila bronzing gel for a realistic sun-tinged glow but the brown and yellow pigments within this bronzer would be great for paler or asian skins. 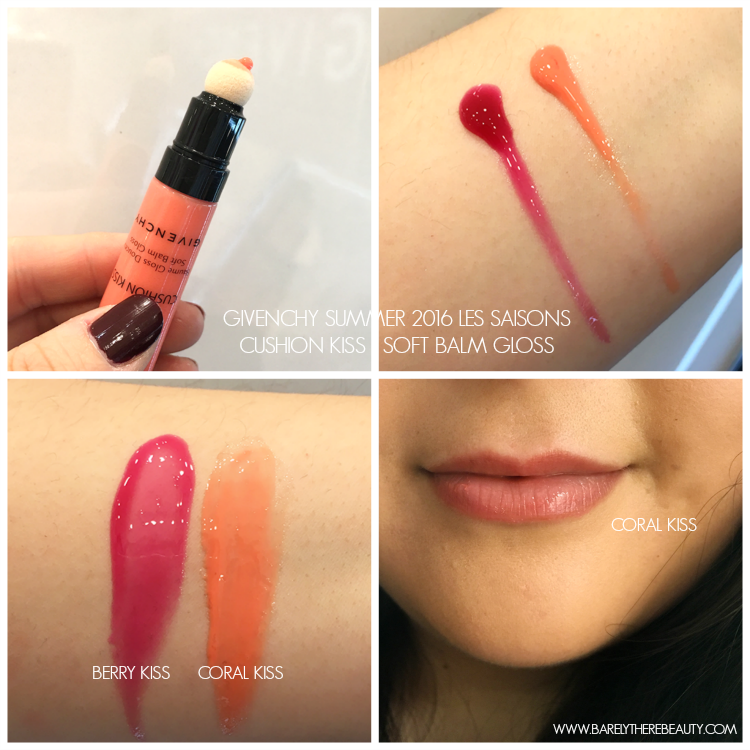 Cushion Kiss Soft Balm Gloss (£18.50) in 01 Coral Kiss and 02 Berry Kiss. Aside from gel formulations, cushion anything immediately gets my attention! These new lip products are desperately pretty swatched. The formula is really quite thick, nothing like the Lancome Juicy Shakers (review here), and I would definitely say this is more of a gloss than a balm. The cushion applicator makes application a doddle, spreading the thick, gloss around with ease. I want to really love these but the colours sadly aren't very pigmented on my lips and whilst they don't feel glossy or gloppy, they do feel very tacky. Les Saisons Healthy Glow Powder (£36) in 00 Moonlight Saison, 02 Douce Saison, 03 Ambre Saison and 04 Extreme Saison. Givenchy have relaunched the Bonne Mine powder in these four stunning, embossed (here we go again! I've got a thing for these) compacts, three shades for bronzing and one for highlighting. The talc free formula is so smooth and creamy and they have a similar imperceptiblity on the skin as the Radiance Enhancer (review here) that I've been raving about. All the shades apply beautifully and there's a super flattering sheen on the skin that Givenchy seem to be doing so well lately, the highlighter especially is fantastic. I think this new range from Givenchy has/had a huge amount of potential! Bringing in jelly/cushion textures that are more reminiscent of Asian beauty had me anticipating the launch like an excitable puppy! Having now had a play, the Mister Radiance blush is an absolute win, the highlighting powder is nice, the lipglosses I'm not so fussed about but, in general, I wish there were more available shades! More gel blush shades please, and I'd like a gel highlight and gel foundation if that's not too much, thank you! Have you tried any of this new Givenchy collection? P.S Have you seen what's new at Chanel? Glad I saw this post as I don't have a Givenchy Counter in my area so I miss all the fab collections. ooo the coral kiss looks really good on your lips - such a pretty shade! 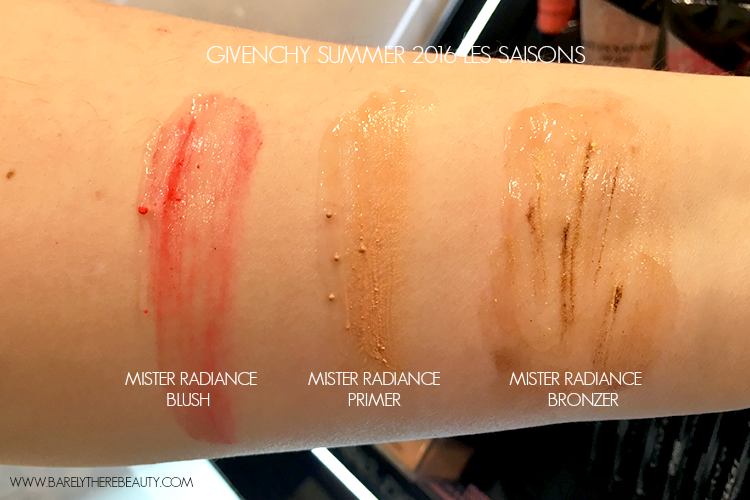 Very nice review & swatches from this Givenchy collection !!! I want them all...but what about ingredients ?? Can you add here or send me pics of their ingredient list please ?